Rediff.com » Movies » There's no dodging the laughs! There's no dodging the laughs! A Ben Stiller film that is not uncouth would be unusual, but what makes his newest film a surprise is that it is truly hilarious and is far more enjoyable than most of the expensive summer wannabe hits. The crass jokes in Dodgeball: A True Underdog Story are not offensive. And though they are not as inspired as the ones in the 1998 worldwide hit There's Something About Mary, they will still send you out of the theatre with a broad grin. Having said that, it should be remembered that many parents would find it embarrassing to see the film with their young children. For those who expect more sophisticated comedies, this certainly is not the film. The low quality humour in the movie is never allowed to be overwhelmed by the film's effort to slam the American obsession with muscles and beauty. Some other writer and director might have set the bar higher, but first-timer Rawson Marshall Thurber clearly belongs to the low comedy tradition made famous by the likes of Mel Brooks (Blazing Saddles). Thurber manages to keep the film moving at a brisk pace, not giving the audience time to think that the story of underdogs wanting to turn into over-achievers is nothing new. By now, over five million fans in North America have shown that Dodgeball is anything but a dog at the box office. The $25 million film that opened with a $30 million three-day gross is expected to be around for over a month and become one of the most profitable films of the season. The film tells the story of an incompetent, absent-minded, but amiable, health club owner Peter La Fleur (Vince Vaughn), who tries to save his club, Average Joe's Gym, from foreclosure by entering a team in the $50,000 world series of dodgeball in Las Vegas. Kate Veatch (Christine Taylor), who works for the bank, has told Peter early on in the film that if he can't pay up 30 days he will lose his business. The gleaming multi-million dollar muscle emporium that wants to eat up Joe's Gym is owned by White Goodman (Ben Stiller), a vulgar creature with an enormous ego. Yet he is so insecure that he surrounds himself with enormous body-builders so that the small guys won't overtake him. White Goodman wants to turn the failing gym into a parking lot. Kate hates Goodman because he has no shame in flaunting his well-inflated crotch. Though she seems to be a loyal employee at the bank, she soon becomes a member of the Average Joe's team to humble Goodman. 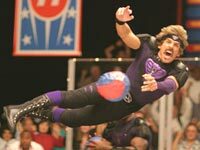 As the preparation begins for the Las Vegas event, we realise that none of the misfits at Average Joe's know anything about dodgeball. If you don't know anything about it, don't bother. Director Thurber has devised a simple and hilarious way to explain it. The geeks and seemingly losers from the gym join the team. Each person is hilarious in his own right. While Stiller will get the best laughs, Peter's sidekicks do not lag behind. The team includes the hapless Steve Gordon (Alan Tudyk), who is convinced that he is a pirate and gets upset when others don't take note of it; Justin (Justin Long), who is crazy about a cheerleader who seems out of boundary for him; Owen (Joel David Moore), who can lead a Mensa club for the dim; and Dwight (Chris Williams), who has such an earnest air about him that you do want to look into his mind. And then there is the tough and mean coach Patches O'Houlihan (Rip Torn). A former dodgeball legend, he is determined to transform the misfits into heroes. The heroes and villains come up with 90 minutes of silly but giddy entertainment. Give us a few more films like this one instead of the painful The Chronicles of Riddick (to mention just one), any day.